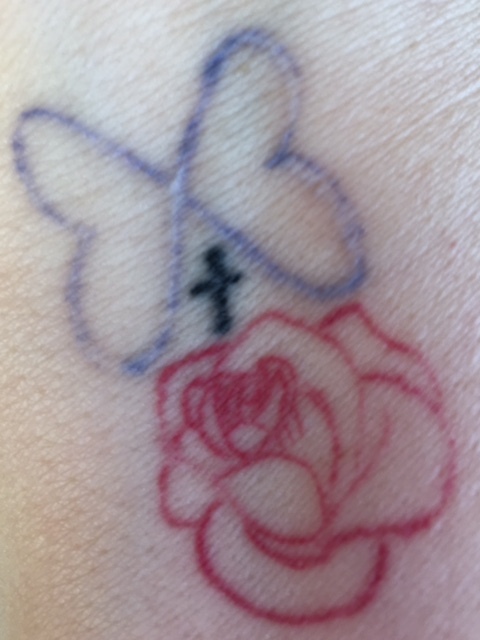 I chose the butterfly for Shelby and the flower for my Allie Rose (whose middle name was chosen as a symbol of the romance from which she was conceived. So this one represents my wonderful husband as well). And I added the cross in the center, because I constantly ask for help in keeping Jesus in the middle of it all. Although I was proud of my choice, you may notice that it doesn’t look so great for a design that’s only 1 year old. I even had one outspoken (or rudely blunt) friend exclaim, “That’s a pretty crappy looking tattoo!” Initially I was a little disappointed that some of the lines look faded and broken, but I had some kind of reaction to the purple ink that included excessive scarring. Even though the artist offered me a free touch-up, any other color than purple wouldn’t appropriately represent Dravet Syndrome. And I didn’t relish another round of gross scabs from the same color. I decided to keep it the way you see it now. And the longer I have it, the more I love it. I love my tattoo because I love the ladies I had this experience alongside. It represents the struggles we all have and the bond we share to be in such an exclusive club. I love it because there are two lines left unblemished. The ones that make up the cross. My marriage, although a sense of great joy for me, is not perfect. And although I am extremely proud of Allie, she is far from flawless. I am reminded of that more and more as she stretches out ever closer to those teenage years. And as sweet as she is, my Shelby is not without issue. She is nut-driving at times and stressful always. But Jesus. HE IS PERFECT. He stands in the middle of all my broken messes as a beacon of beauty and hope. His love never fades and He never disappoints. He is holding it all together. So mostly, I love my messed up tattoo because I love my perfect Savior. Do you know Him? If you don’t, I would love the opportunity to tell you more. I have never been crazy about your tattoo…but I am crazy about this article and I like your tattoo more now!